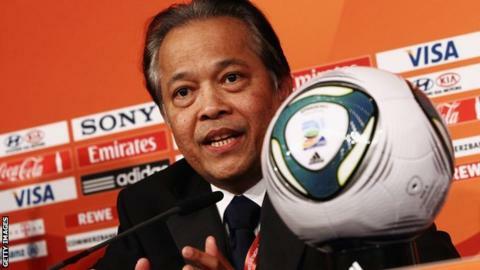 Fifa has banned former Thai football federation president Worawi Makudi for three months. Football's world governing body found he had breached an earlier ban that barred him from all football activity. Makudi, a former member of Fifa's executive committee, was banned for 90 days in October after allegedly breaching Fifa's code of ethics. The 64-year-old was part of the group when it voted on who should host the 2018 and 2022 World Cups in 2010. According to Fifa, Makudi was "still involved in the affairs" of his national association during his suspension. Makudi has also been fined 3,000 Swiss francs (£2,133).